South Florida’s notorious summer heat, with that tropical injection of stifling humidity, peaks for several weeks as teen athletes start August practices throughout high school and college practice fields. But as Fernando Mendoza, M.D., medical director, Baptist Children’s Hospital Emergency Center, emphasizes sharply, this is the time to be vigilant about heat-related injuries at sports training camps. Those conditions can range from heat cramps to heat stroke, which is a very serious condition requiring emergency treatment. It’s not just the older kids who need to be careful. Parents of younger kids at playgrounds or even in the backyard should know about signs and symptoms of dehydration, which is the first big step toward heat-related illnesses. But it’s those long practices sessions that high school athletes go through that often pose a larger risk to both young men and women. Most public and private schools have qualified coaching personnel who can watch for signs of dehydration. They are supposed to keep participants well hydrated with water or sports drinks, which contain key “electrolytes” — such as potassium, magnesium, calcium, and sodium — which help the body replenish fluids lost through sweating that water alone can’t replace. If muscle cramps creep in during a workout in the summer heat, then that’s a sign that physical activity should top and the individual should move to a cool place for a period of time and drink fluids, says Dr. Mendoza. Heat exhaustion is the next phase after cramps. That’s when you get cold, pale and clammy skin, along with heavy sweating, an abnormal pulse. Other potential signs of heat exhaustion are nausea or vomiting, dizziness, headache or fainting. If you don’t recover after some rest and fluids – it’s time to get to your nearest pediatric emergency room, like the one at Baptist Children’s Hospital. The most severe heat-related illness would be heat stroke — an emergency which requires a call to 911 and the immediate moving of the affected individual to a cool place to help bring his or her body temperature down. “At that point, your body can no longer compensate with its cooling mechanisms,” explains Dr. Mendoza. “With heat exhaustion, you’re trying to sweat off or cool off your body. But at the point of heat stroke, your body is in a cycle where it’s starting to break down muscle and protein. It’s a really dangerous situation, and you actually develop a fever, a high body temperature of 103 degrees or higher. 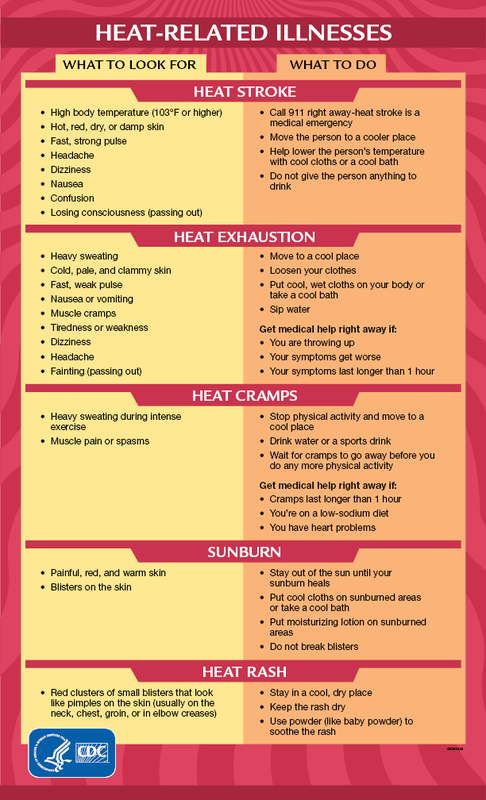 Below is a helpful breakdown of heat-related illnesses, including symptoms and steps to take, from the U.S. Centers for Disease Control and Prevention (CDC).